We have been comparing many faces lately. 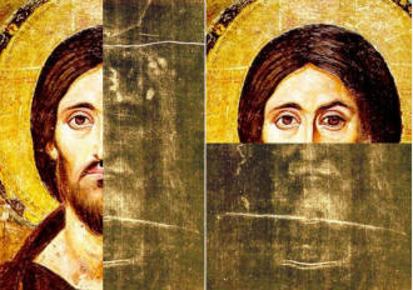 Of course, if this face comparison is proof that Leonard da Vinci’s face is on the shroud than other comparison, similarly done, prove that the proof is not proof. Or is it that this comparison is flawed? In what ways? 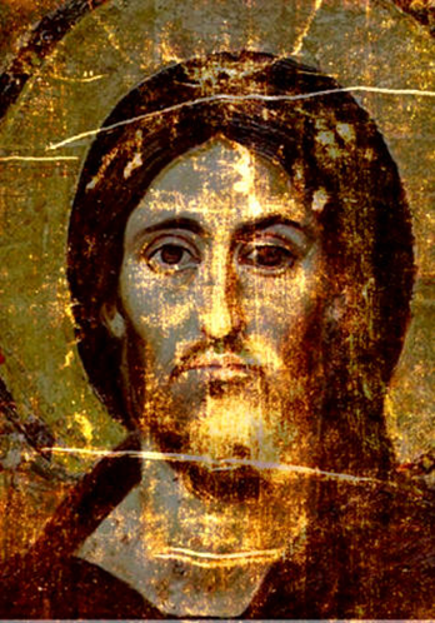 And, how come no one is talking about the 6th century Christ Pantocrator at St. Catherine’s Monastery in the Sinai? Leonardo was born in 1452. These people are weird, eccentric, not difficult to find in the region where they are. there was no photograph at that time, and Ray Downing and his whole team found the tornplant that is only growing in Israel, als the blood is from a virgin birth. those people want to get his right, but the true is Ray is right, who else clean my fish tank 250 gallon? Nobody can change my mind, since the painting is near the tank its pure clear water. And it proofs Yehoshua (Jesus) is still alive and around us and in us everywhere. And even my new baby Malawi’s eat out of my hand. It’s an opinion, but i agree. Yes that is opinion. I agree. Hugh, just one should develop some clear and sensible rules not to get lost in all that mess with images. That work is in progress already. My response for P&P claims is already being worked on. This face matching stuff is a joke. It seems that epigrapher Ada Yardeni has found the inscription on the Ivory Pomegranate to be a fake. The pomegranate predates the Jerusalem Temple by centuries and the inscription is modern. In my view, this is somewhat similar to what was done to the James ossuary, with only the first part of the inscription being authentic. My hunch is that the forger added “brother of Jesus” to “James son of Joseph”, taking it for granted that it would be interpreted as referring to James the Just, first of the twelve Jewish Christian bishops of Jerusalem. He did not know — or ignored the fact — that according to Old Testament usage, also valid in the New Testament period, “Joseph” would be the “brother of “Jesus”. It looks like there are people who love to pick on Jesus. He sells and the work is of course agenda-driven. I must add that both the James ossuary and the Ivory Pomegranate were with Oded Golan. It is known that an Egyptian antiquarian living in Cairo was forging many inscriptions and was working for Golan, but he did not appear at the trial in Jerusalem. The court returned the ossuary to Golan, making it clear —like the Israel Antiquities Authority — that it did not endorse his claim, and stating that part of the inscription was forged. Much before all this, Professor Amos Kloner, former Jerusalem District Archaeologist, who dismissed the “Jesus family tomb”, had said the same thing to Dr. Gideon Avni in a written report.